I’m a bit overdue in reporting on my first appearance at Chapel Con. 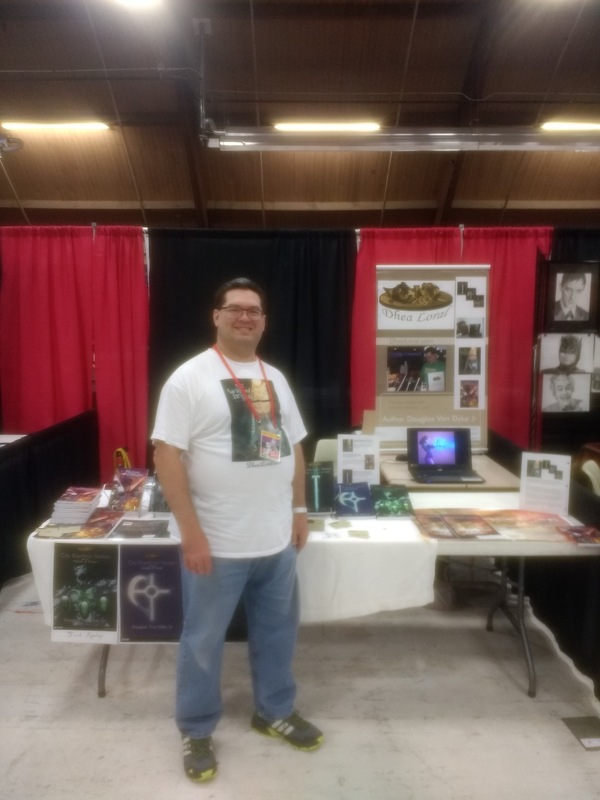 Although, bear in mind my first ever con appearance was QuestCon in Oct 2017, so all the conventions I’m hitting this year are all first time appearances. 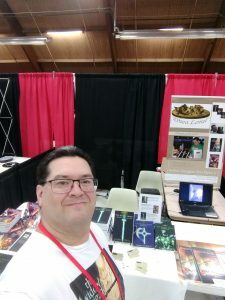 Each of them are a new experience as I take a bigger step into the world of being an indie author and getting out the door to sell my books face-to-face. Prior to Oct 2017, my appearances have been at local bookstores and coffee shops. Conventions require a larger upfront cost, a bit of travel, and a myriad of small things to juggle. Since this is my first big convention discussion, let’s talk about them in general. 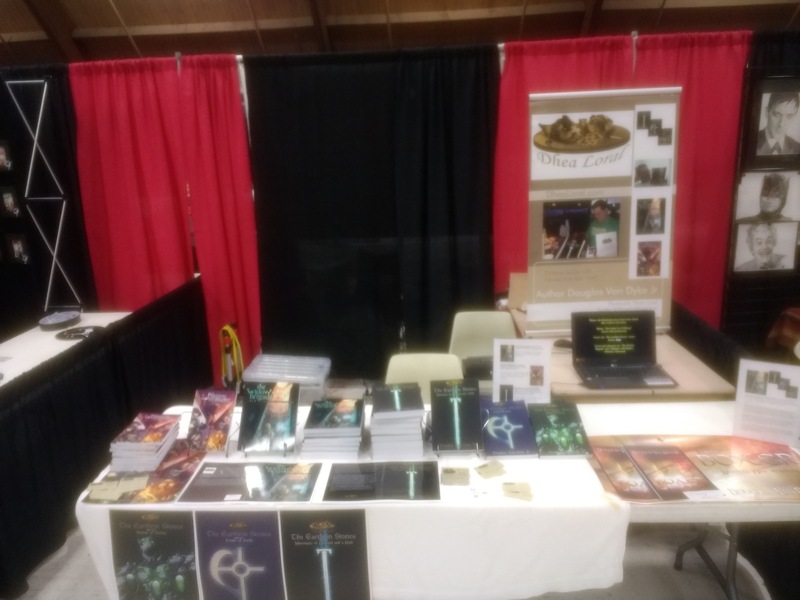 An author may pay anywhere from “free” to over $200 just securing a table at a convention, and that’s if you get the table space over another author or vendor. Venues that allow you to have a table free are very uncommon and have tough competition. They are usually slated towards others just like yourself, and can fill up seller space quickly. Anything over $100 begins to be a steep price for a beginning indie author. To make a profit at these, it’s not about selling $100 worth of books, it’s about selling $100 worth of profit margin. What do you get for the price? Anywhere from 4′-10′ of table space and a chair or two. WiFi passwords may be a small charge, electricity can be a large fee. Not that electricity is necessary, but as you’ll read below, I used it at Chapel Con as a nice advertising extra. End-of-row selling spots can cost extra as well. Also, you may have a variable amount of room behind you for boxes, extra books and advertising space. I’ve been in spaces too tight to properly display my stand-up poster, and other places you don’t have a spot to hang anything. I try not to count meals as an expense. As another told me, I might be eating out even if I wasn’t at the convention. Still, it’s good to bring a snack or a cold sandwich to satisfy those hunger pains during the long day, and still save a little bit on “eating out” expenses. Don’t forget a jug of ice water. The other big expense is where you’ll be sleeping. As you get to network with authors and artists in your area, you may find partners willing to split cheap motel rooms. Even a campground with a shower is an option if you’re willing. Compared to some of the tables above, imagine pairing a $200 convention fee with a $200 hotel room. Better sharpen those catch-lines and product summaries for when those customers walk by! Your first conventions may only serve to meet and greet artists, authors, and convention people in your area, but we all want to eventually make that profit. Ok, I waited long enough to get to the point, didn’t I? First of all, the convention’s artist price was the lowest I’ve ever seen. (Aside from the free ones.) I took an option they had in which I pay the lower upfront price, but I also have to pay 10% of my daily profits at the end of the day. This left me a larger chance at getting a good profit. WiFi was a small $10 charge, but worth it. Electricity was free! I used that opportunity to set up my laptop and continuously loop my YouTube intro video. I kept it muted though, out of respect of everyone around me. A few people stopped and watched the screen, (the human race has become drawn to screens). The other big expense is usually the hotel room. I partnered with another author and really only stayed at the motel for the night of sleep. We took the cheapest motel in the area. As things turned out, another author who paid more found himself in a leaky hotel room and had to complain to move rooms. Albert Lea, Mn, does have some cheap motels and three nearby campgrounds/RV areas. Not a big cost. The Chapel Con’s general setup was the biggest plus other than their low fees for artists. Parking wasn’t a hassle, you could load and unload and the lot for vendors wasn’t far away. They had an army of helpers at the door and walking the convention floor. They offered to help the vendors carry in and out. For us solitary sellers, we were allowed to borrow one of their wandering helpers to watch our stuff if we had to step away for bathroom or anything. Since the locale left limited food choices outside the hall, they had a nice basic grill menu from those who did cater. Nice cheap meals…but the best part was that you could call them and have them deliver straight to your vending spot! In general, I felt very well-cared-for by the staff and felt that I was a VIP also. There were a lot of authors and artists, quite a few cosplayers, and a number of toy sellers. The 501st Legion was there, complete with remote control R2-D2 and BB-8. A pair of motorcycles took up one oversized vendor spot. The two biggest celebrity stars were Sam Jones (Flash Gordon) and Ryan Hurst (Opie Winston, Sons of Anarchy). Saturday night featured a fun block party. The local bar had trivia questions for prizes, and Sam Jones made an appearance! He actually joined our group and chatted with us. A live band performed out in the street. In general, I had a great time and made enough profit to cover all my expenses. It’s already one of my top events to hit next year.